I’ve been a newspaper reporter in Oregon, a fisherman in Maine, a bookseller’s assistant in Anne Arbor, Michigan. I have a Master of Arts in History from the University of Virginia. I’ve been in love five or six times. For a few years I lived off the land in North Carolina, raising all my own crops and chickens and goats. I’m 43 years old. My name is Walt. I’ve been divorced, lost jobs, and I’ve grieved for my mother and my brother a decade apart. I’ve known panic, anxiety so bad it felt like my hands and my head had swollen up the size of the room I was in. The truest way to stay sane is to look for the deep sense of mystery in things. That’s what keeps me connected. Without that sense of mystery in things, it would all fall apart for me, and I would fall apart with it. Often I sustain the mystery by thinking about the ancient age of the land beneath me and around me. I think about how much humanly has happened here (in any here I find myself). I think about how that kind of depth means several worlds can have occupied one place. That means they’re still here, still visible in traces beneath layers and layers. It’s like tree rings—dendrochronology—but piled up on top of each other. No, it’s more like when scientists bore miles down into ice to pull up an ice core from hundreds of thousands of years ago to see what chemicals were combined in what ways in the atmosphere then. I’m always looking for that kind of evidence of the past here in the nonce, depth-sounding. The past sticks up in an urban landscape in the form of a shell midden, an arrowhead, or architectural debris. There’s another way of looking at urban time. Urban time is compressed. So much happens in such a small amount of time. The urban landscape that’s not renovated, not maintained, not renewed quickly falls into its own post-apocalypse. Fifty years of junk in a random industrial district can equal centuries of decline elsewhere. It’s also possible, however, with the sense of deep-time mystery to see tens, hundreds, thousands of years, even longer periods of time in the unfurling of a new leaf, or in the fiddlehead of a new fern frond. Everything always reuses the elements and nothing is as old as what’s new. The depth-sounded sense of the mysterious can be found in any object. Since it’s a form of meditation, I keep good exercise by sounding the dullest, most banal and ordinary things. One of the things I most love is looking for the random, the accidental in that post-apocalyptic urban compressed-time. Then refuse becomes “found art.” All of it does. A bent and rusted bicycle rim, a rusted railroad spike, an old gin bottle, obsolete machine parts, bones. These things become archaeological artifacts, even if my archaeology is personal, psychological. No more places exist off the map, so the mapped must be explored, and when you find the strange in what was familiar, or when you find out how alien and hostile your own home-space is, then you’ve ceased treading out on the surface boundaries of things, and you’ve begun to go deep-in. Thus I come to what I can add to this strange text—text that is library, bible, biblioteque, history, geography, novel, opera, epic, maximalist haiku (why not?). Contributions have come from the detective who assembled depositions and visited dunehouses, from students embarked on ghost landscapes, from legend trippers and psychogeographers and orienteers, from a guy who seems to think he writes the city out of his own small house (“with the city inside”). Sure. Why not? My modus operandi calls for coming to random parts of random places as an act of meditation. So what I’m really doing is both treading out on the surface boundaries of things and, simultaneously, going deep-in. Meditation on the deep-time mystery in all things calls for exercise. London’s too easy. I found ghosts everywhere I went in London, the same way the tourist finds historical markers every few paces there. Likewise, Paris. Rome. Venice. Athens. The real challenge is finding ghosts in a brand-new shopping mall in any American suburb. Oh, I promise you they’re there. No place creepier. The brand-new shopping mall is already dead, sterile, more a zombie than a ghost really. The very emptiness of the place, especially in the incongruity of its being crowded with hundreds of living people, haunts. Even more haunting comes the fact that even these corporate stores that try so hard to get away from the fact that they belong to the planet Earth, which I define as billions of years of the dead being recycled into the living, cannot get away from that basic definition. Their digital imagery, their drywall, their corporate logos all still consist of all the death that came before them. Seen this way, I find Abercrombie and Fitch both a consumerist zombie imaging of images of images of actual life and a conglomerate of ancient elements as elemental as the ancient elements in an oak tree or a jellyfish rotting in the sun on the beach. So what I have to offer is why I came to this town. It’s what I do. When I have time off from my current position as articulation officer for the University of Vermont, I visit a random city and I walk through some most random part of that random city. The randomness is important. It has to do with my particular spiritual way of seeing the world. I don’t believe in a grand design that stretches from the beginning of the world to the end, and to which only the religious faithful can be attuned as the special secret-bearers of God’s truth. I don’t believe that everything happens for a reason. I don’t believe God does monstrous and despicable things to people in order for the people who loved them to learn valuable lessons. I believe that things happen. I believe that if uncountable actions of uncountable objects are set in motion, then a lot of things will happen by chance, by accident, by circumstance. Believing in randomness in this way does not mean that I don’t believe in miracles. On the contrary, it means I believe in them all the more. If one all-knowing and all-powerful being lazily deems a thing to happen, it’s not so miraculous that it happens. On the other hand, if billions of years of life have engendered an almost infinite creativity, countless accidental juxtapositions between countless beings, then everything you and I experience together is a miracle for having happened particularly to us. In four and half billion years of this planet’s existence, what were the chances that the two of us would be brothers, or that the two of us would be teacher and student, or that the two of us would fall in love, or that the two of us would pass each other unawares in the grocery story on Tuesday, November 23, 2010? The odds are mathematically impossible, and yet they happen, and that makes everything that happens every single day its own miracle. So there is nothing that does not interest me. Often what interests me most is what gets least interest elsewhere. The very fact of its receiving less interest makes it more interesting to me. Makes it secret. Makes it hidden. Makes it occult. So I pick the most random city and I consider it occult. I might pick Duluth, and I have walked it. I might pick Helena, and I have walked it. I might pick Omaha, and I have walked it. This time I pick Jacksonville and sift out Jacksonville, North Carolina and sift out Jacksonville, Arkansas. Just as I remember being 11 years old and thinking that 37 was the most random number, it now occurs to me that Jacksonville, Florida is the most random city, and that, then, is where I must be. But I’ve got to pick some part of it. Its mayor and its Better Business Bureau will advertise it as the largest city in the United States, only because its county and city governments are consolidated. Consolidation means its actual city population and its metropolitan (meaning within and without city limits) population are 913,125 and 1.5 million, respectively, while Atlanta (which Jacksonville always compares itself to and thinks of as the “New York of the South”) has a city population and metropolitan population of 540,922 and 5.5 million, respectively. In other words, in presently megalopolitan America, city population doesn’t mean squat, and metro population is what people really mean when they talk about how big a city is. Jacksonville is mostly woods and cow pastures. So I’ve got to pick some part of it. I try to come up with any most random part, but almost all of Jacksonville is random. There are a couple of distinctive neighborhoods and communities, but 90 percent of the city seems identical to what might be found in suburban Des Moines. So I come up with a part of Jacksonville that is Jacksonville, but still must be called a random part of this random city: Talleyrand Avenue. Here, randomly, on this bleak street of which most of the city’s residents know nothing, in this flat and gray and transient landscape, I’m going to look for the past sticking up through the landscape like a bone sticking out of the leg. I’m going to look for the miraculous in the bland. I’m going to look for the magical in a beige corrugated-metal landscape. I’m going to find deep-time in the immediately obsolete. I’m going to assuage personal hurt in a ritualistic practice of uncovering the deep sense of mystery in one of the main avenues of Jacksonville, Florida about which the city has the least to say. But 500 years of decay have occurred in the last 50 years along Talleyrand Avenue, and I am determined to immerse myself in it. Multi-acre parking lots have no life, nor purpose, for most days of the week most of the year. They serve and make money only as parking lots for professional football games a quarter mile away every other Sunday for a few months. I walk, a lone bi-ped in this weird world, backpacker in need of a shave. I try my best to blend in with rusted corrugated-metal sheds grown green on the sides that stretch the length of a city block. I pass this two-story wooden house at Hill and Talleyrand. “No Trespassing.” “Bad Dog.” Side window filled with dirty Confederate flag. One house, 100 year-old house, built when this was the neighborhood of Fairfield, one collapsing house in all the Talleyrand Wastes. You mean somebody lives here? Ionic columns on the porch. The rotten second-floor window shutters are open over the porch. Coming to Clarkson Street, where stood Roseland House, which housed an early motion picture studio, the Kalem Co. Most of the street stands behind an eight-foot tall chain-link fence. Small white shack just the other side. Green work trucks. Rusted girders. Everywhere signs warning of surveillance. “Shutters and Blinds Buy Direct 379-7544.” Dumpsters and dumpy boats on the roadway, broken pallets and stacks of tires. Pallet Express, Inc. is housed in a corrugated beige shed a city block long with jalousied windows on the sides, burnt oil drums on the sidewalks and behind all this, a railroad track blocking off riverfront warehouses. Massive rusted girders, a 100 year-old brick warehouse on the river, all plywood-sheeted up, and standing around idle in empty parking lots are large lifts on tractor treads. Giant sheds rattle with industrial-size fans, tall rusted cranes stand high over the buildings, and everything’s rusted, everything, a thousand stacks of wooden pallets. Hidden here, block-long corrugated sheds between railroad tracks and palm trees and the river—lost world. Utterly alone in the Talleyrand Wastes, empty metal deserts, so alone here I feel my own presence as that of another, so alone I am spooked by the presence of myself found everywhere in this industrial void, place so empty I feel it filled with invisible presences, yes, human presences of the neighborhoods chronologically buried in this sad riverbank, but also alive intelligences of the corners and conjunctions of the place itself. Intelligences of industrial sheds, of the curves of railroad and the corners of stacks of pallets against friendless palm trees, of narrow streets blocked off from narrow streets by sad metal and wide open empty foundations missing their former buildings but covered in broken glass and trash. All these things wait here, lonely and menacing, for what no one in the world can know, for the Talleyrand Wastes lies entirely severed from the world, a waste squalid in its own waste, and brooding. Here I sustain my sense of the deep mystery of the world in the dullest, bleakest, blandest concrete and asphalt moors. Nothing isn’t gray. Behind metal warehouses behind warehouses behind unclimbable chain-link fences and railroad tracks, I find the bloated body floating in the water. Some poor fisherman? Some poor bloke jumping to his death from the Hart Bridge? I can’t tell if the stench in the air is part his, surely it must be, or if the smell of him is subsumed or buried in the smell of unnamable chemicals and wastewater and sulfur dioxide in the air. I wonder what I am doing to my body by taking Talleyrand into my lungs. The body floats in a thick sheen of oil coating the river’s surface from far out toward the middle and up against the dirty berms. Its blue work pants and white shirt have been swollen against and split apart. I prod a long thin piece of pipe into the water and stir its thick viscosity. I think I am Charon poling my skiff across the River Styx into the land of the dead. Muck churns in the water and I can detect a distinct smell of diesel for a moment before it blends with the sad dank and rotten smell of Talleyrand. I set free dioxins and polychlorinated biphenyls, and with them the specters of skin disease and birth defects and a thousand cancers. Nothing lives in this water along this riverbank on which nothing lives. I leave the red and blue flashing patrol car lights to bounce off the hundred shades of gray of the walls of metal and pallet and plywood and metal, and I leave the bloated body in the oil in the river. My breath came in rasps. I felt it scratch against my throat. Wandering through these vast open concrete yards piled with junk, my sense of place begins to swim. I think I’ve passed these buildings before. I think I’ve stepped on this collapse of concrete already. I walk along the railroad track and watch it curve in a way I’ve surely already veered. Then next to the track, I see something I have not seen. By the side of the railroad, by a raggedy prickly pear bulbously falling across the sandy gravel, I’ve spied a hole in the ground. It’s not a gopher tortoise burrow or some mangy animal’s tunnel. It’s framed by old planks on each side, like the entrance to some abandoned 19th-century mine, but it’s not wide enough for me to fit through. Not that I’d want to do so, and not that I wouldn’t. It disturbs me to realize that it would easily be wide enough for a child to fit through, and I can’t help but picture that. Stupidly, I put my face down to the hole and say, “Hello” down into the earth. I can’t see anything down the hole, and I hear nothing move about beneath me. I look around and see some unrecognizable dead shrub, make my way toward it, and break off a thin branch slightly longer than my arm. Stepping back to the miniature mine, I poke the stick into the aperture, and find that the hole curves but stretches at least the length of the stick. Now a stupid kind of panic wells up from my gut, as I can’t help but imagine a child down there, or some clumsy animal. Again I say hello into the earth. I wish I had thought to bring a flashlight. Then, beneath my feet, there’s a certain rumble. I imagine it coming up from the hole and stand there puzzled for a moment before I realize that somewhere around the curve of track in these plague fields, a train is coming. And it comes and it comes. I think how I’ve never been so close to a train on foot as I’m about to be. I am standing right next to the tracks. I’ve never known the ground shakes so substantially at the approach of a train. I step back behind the prickly pear and some palmettos and broken red plastic fruit crates, and I stand there like a ghost against yet another tall chain-link fence and watch the train come. I watch it bore through the wastes. I watch it come on like a freight train, which is of course exactly what it is, and I’ve never known the feeling of a thing so powerful, so dead and unknowingly powerful. I watch the train for 10 minutes, 15 minutes, and when it’s gone, I stumble back to the opening of the mineshaft. No one and nothing has emerged. I pull a piece of plywood from a stack against the fence and cover the hole. Briefly, the horror of trapping a child or a rabbit down there chills me, but I feel certain the shaft is empty and am concerned with protecting the child or rabbit in my imagination from falling down it in the first place. Now I walk back around the curve of track. I need to get back to the streets. I’m disoriented, my inner-compass confused. Mineshafts for gnomes and bloated bodies in oil slicks were not part of what I expected to find. This whole wasteland is not just an urban space in which time is compressed and where the past glows through in the faint flickering lights of its deep mystery. This place is a sick place, an attenuated diseased body one must wade through. The Talleyrand air is sick with itself, raw and bleeding in its own miasmas. It scratches and claws its way up its own throat, shredding the tender flesh, breathlessly trying to work its way up into its own open mouth and out of its skull and into some freer atmosphere than exists at all here. Since I envision the past as varied geological layers of ground beneath our feet, or even as deeper layers of experience in which we stand, I picture beneath this placeless place, beneath this filthy and poisoned and bilious conjunction of air and ground, whatever that wild place was where, in the late 1860s and early 1870s, a two-seated surrey was pulled by bay horses decked out in polished gold harnesses and jingling sleigh-bells by Charles Maurice Camille, Marquis de Talleyrand-Perigord. All this waste was then the marquis’s estate of Millwood in the very northeastern corner of Jacksonville’s boundaries. Millwood had been the property of one of the city’s earliest city leaders, James Jacquelin Daniel. It was named after the sawmill from which the Daniel family attained its wealth in the days when Jacksonville was almost nothing but sawmills. When Daniel came home ill from the Civil War in 1862, he found Millwood abandoned and the city occupied by Union troops. He, his son, and his brother-in-law boarded up the family house and removed a modicum of possessions. Everything that was left that would not be injured thereby was buried [!] Buried? Buried here at Millwood, here in the Talleyrand Wastes. Where is it buried and to what extent has it become again the earth? In this kind of depth sounding, archaeology must be represented as much by what is lost, by what ghosts are set asunder among us, as by what is found. In a telling irony, the Confederates and not the Unionists descended upon Federally occupied Jacksonville and burnt seven of the eight local sawmills, including their warehouses, and four million board feet of lumber. The Confederates burnt down the economic engines of this Southern town. In 1866, the Daniels returned to Millwood and the south bank of Long Branch Creek, but two teenage girls, Rosa L’Engle, James Jacquelin Daniel’s sister-in-law, and her friend Lula Pullen, accidentally drowned in the St. Johns River. J.J. Daniel himself would die in the 1888 Yellow Fever epidemic. In 1869, the Marquis de Talleyrand-Perigord bought Millwood and gamboled about with his golden-harnessed bay horses arrayed in their jingle-bells. 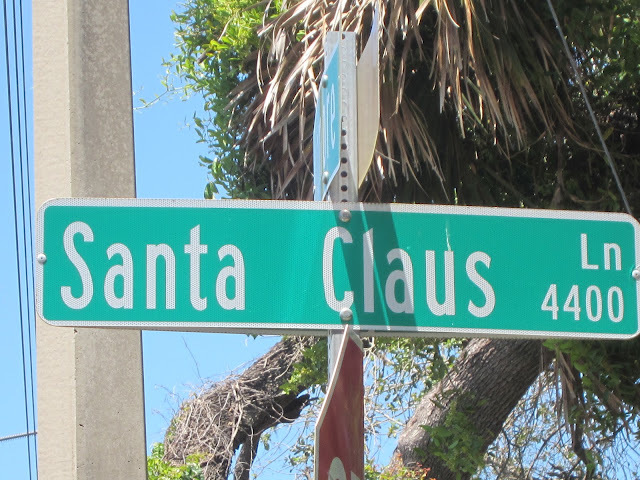 Talleyrand Avenue began as the East Shell Road, obviously named for its original pavement, in 1873, connecting the Eastside north to Panama Park at the Trout River. Ninety years later, 1962, the Plymouth Cordage Fertilizer Company exploded at 1611 Talleyrand Avenue. The 31-acre site had been occupied as a fertilizer factory and distribution center since 1893. In the 1950s, when Wilson and Toomer Fertilizer Company sold the property to Plymouth Cordage, the land also hosted a pesticide manufactory. 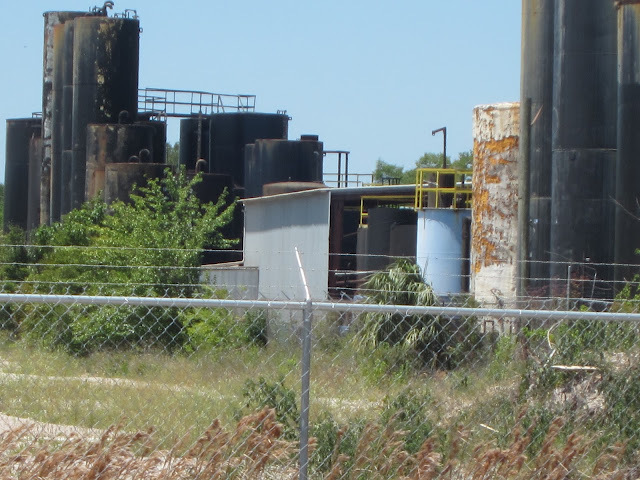 In 1965, Ernhart Corporation bought the property, and Kerr McGee Chemical Company purchased it in 1970, creating, mixing, and packaging pesticides and fertilizers until they closed the site in 1978. All buildings on the site have long been demolished. The soil itself has been saturated with pesticides, including dioxins and PCBs, the same as those found in the muck of the riverbank, and several heavy and toxic metals, including arsenic and lead. 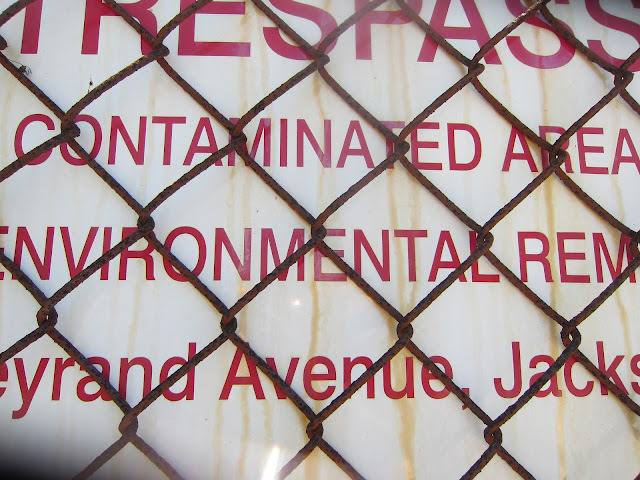 Two plumes of groundwater infused with trichloroethylene and arsenic balloon out from the site underground and enter the waters of the St. Johns River. A 2005 Human Health Risk Assessment conducted by the federal Environmental Protection Agency concluded that “Maintenance workers and trespassers” (the latter category is me) would be “exposed to an unacceptable cancer risk.” In 2003, developers who proposed turning these riverfront properties northeast of downtown into apartments or condos were informed that anyone living on this site would likely become sick within weeks. Walking now along the Talleyrand Wastes, Millwood, East Shell Road, the Kerr McGee “brownfield,” with my out-of-print local histories and my EPA reports in my backpack, the pure ghostliness of loneliness catches up with me, and I distinctly hear footsteps behind me. I walk faster, though these blocks stretch on and on and the buildings themselves are as long and monotonous as the boundary between boredom and depression. Still, I refuse to turn around, because I know no one is there. I don’t want to play this game with myself, this duck and cover, this hide and seek. So I let the footsteps keep on sounding behind me until finally they too have stretched out and been diluted in the ghostly silence. For what it means to be a writer is to be a ghost in the landscape. You are the invisible watcher. You are the unmoved mover. The cliché of the writer as wallflower. That’s one cliché. The opposite cliché of the writer as experiencer of everything human. Terence. Walt Whitman. Truth is always some of both and in between. As ghost in the landscape, I watch, I take in everything, I experience, but I experience through witnessing. Writer as witness. So it helps to have been fisherman and newspaperman and driver of forklifts. It also helps to know the political and psychological and literary theory. I watch the world, that’s what I do, and I watch the world by walking ghostly through its landscapes. How else could I have stayed sane? The writer who loses a wife, who loses his job, who mourns, is a richer writer. He is he who understands more. He is he who has lived. Likewise the writer who walks along the beach and the mountain ridge and the ghetto and the polluted industrial cancer field is he who has been there, he who has walked through, he who has known the world. The secret to a desolation like this one is that a landscape itself is a destination. You cannot be lost. You cannot not-arrive. You are there the whole time. The whole landscape is the destination. Once again I hear the footsteps, and this time I look behind me, knowing I will see nobody there. I think about the truth in that grammar. To see nobody is not the same as not seeing anybody. It’s not just true I do not see anyone, but that I, in fact, see nobody. I see nobody, because there is a presence here, the presence of absence. I see the presence all around me, though having turned around, I don’t hear the footsteps anymore. Instead I hear the husked rattling of dead brown palmetto fronds against a rusted tractor trailer. The fronds clatter against the spikes on the thick palmetto stalk, and the plant reminds me of some dinosaur skeleton pushed up from the earth in the industrial portside. I feel as though it’s been following me, but I know that’s too simple. This whole wasteland walks with me. The Talleyrand Wastes are the nobody, the present absence. I and the Wastes each play ghost to the other. I am the watching ghost walking the East Shell Road through its desolation, but as I walk through the Wastes, the Wastes inhabit me as well. When I leave it behind, I will take it with me, for places inhabit people as much as people inhabit places. Talleyrand has carved a big desert in my chest that I won’t be able to stitch magically shut. If person and place inhabit each other, then I likewise inhabit this place inside of its inhabitation of me. That doubles me. I have been stalking myself. It’s me back there behind me, and though I search out every sightline between palmetto and trailer or trash pile, I can catch no glimpse of me out there. Still I feel my own presence behind me. The me I cannot see behind me and the vast nobody that I see everywhere in these battered streets are one and the same. This acknowledgement disorients me, overcomes me, dizzies and exhausts me. I want out, but I have long bleak blocks still to walk. Obscuring the river from East Shell Road now are hundreds of tractor trailers lined up like sloughed off bodies. Wind blows a dirt storm across railroad tracks. 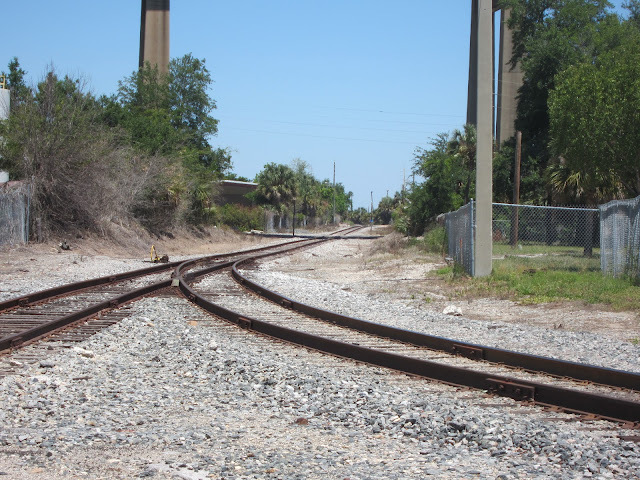 So many of these roads along Talleyrand contain long-obsolete railroad tracks partly buried in the asphalt and disappearing up under a warehouse or a clump of dusty palms. In one direction a maze of petroleum piping wraps around itself. For long stretches, vast concrete flatlands gape full of nothingness, dollar weeds and dog fennel emerging from cracks in tired pavement. An unbearable force obtains in such nothing, a force that seems stupidly intelligent, like a black hole. Or maybe it’s time itself. And space. Walking across the concrete flatlands feels like walking through the intersecting gulfs of distant time and wide space. I am swallowed up. By the port authority’s Talleyrand Marine Terminal, I walk past just unloaded new cars, rows and rows and columns and columns of them. It’s like I’m in an Andy Warhol silkscreen. I’m walking past diesel tanks and enormous metal transit cranes and 50-ton rubber-tired gantry cranes, a whirly crane and container stackers. I’m walking through 5,000 feet of terminal space, massive pilings of steel girders, whole stockyards pull of lumber, tractor trailers stacked on top of the other, four high and 16 deep. The terminal goes on and on until it disappears into itself. I’m more aware of the gray road and the light blue sky than anything else. Between the Jaxport terminal and the Buckman Water Reclamation Facility, it’s a kind of concrete prairie. Then, finally, trees, albeit ragged sad trees. And enormous petroleum tanks. After 21st Street, Talleyrand curves and houses appear on the left, yellow houses, pink houses, brown houses. A pink clapboard house with swings and a picnic table implanted with an umbrella. Still the silence and the emptiness. I see nobody here. There is no automobile traffic. There is barely any sign of life, just the sad ragged trees. Then Kennedy Generating Station, No. N001. Now Talleyrand curves more radically with the bend in the river, but just as quickly it dies out. 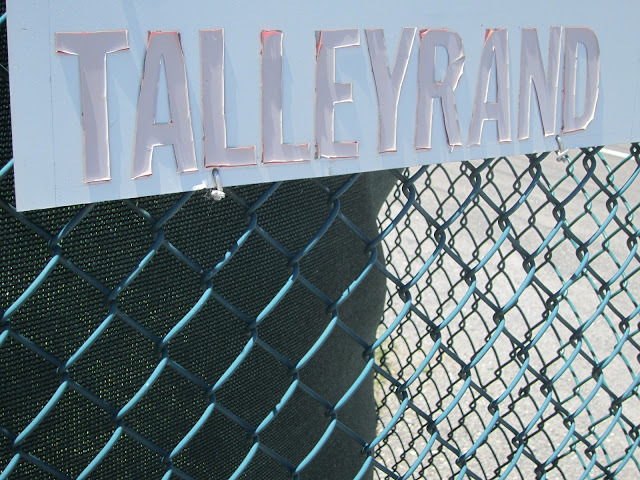 Talleyrand keeps going, but it isn’t Talleyrand. Now I’m on Wigmore Street. In vast expanses of weeds sit big pyramids of dirt and sand. More railroad tracks lie submerged in the road. Roads extend riverward from Wigmore for 20 yards and then their asphalt bursts forth with trees crowded with blown tires and glass and gin bottles and trash. Nameless creeks in the woods overflow with brown viscous sludge. 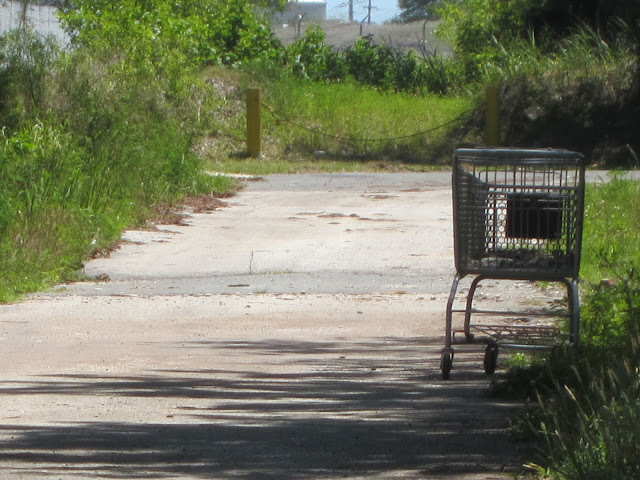 One-lane streets slip back into the woods and into wooded yards of anonymous chemical tanks. At the corner of Hudson and Morrison Streets, blocks with no buildings, rusted-out stoves and boats full of holes and filthy carpets and mattresses pile up under the trees. A cop is walking around in a bullet-proof vest with a leashed dog sniffing furiously. I say hello. He looks at me coldly, doesn’t speak. I’m near the end of this walk. Talleyrand has disintegrated into Wigmore, and the wastes I’ve walked have turned into more wooded wastes, not more sinister, but sinister in a different way. Where everything was open before, everything is close and claustrophobic now. These are poisonous woods, and they crowd in on me. I need to leave, but I’m not heading for an ex-wife in Sioux Falls, not this time, or to lose myself in random landscapes in Scranton, PA, or Mobile, AL, or Topeka, KS, or Cheyenne, WY, or Twin Falls, ID, no, this time I think I need to get out of the country for a while. I’ve got too much to leave behind and too much of what I’m leaving behind to incorporate into whatever I’m becoming. I even think I need to fall in love with somebody again. I even think I’m open to religion. I’m thinking maybe Costa Rica or Saskatchewan, or maybe I need to make a cleaner break. Brazil’s a big, wide, booming, welcoming place. Panama City, Panama, true capital of the Americas, the very middle country, international banking and money-laundering cosmopolis, the Bridge of the Americas that sutures up North and South and Central America right in the middle of the whole thing, the whole America from North Pole to South Pole, I need right now to walk across Le Puente de las Américas. But I know that immediately ahead of me, Wigmore will wend its way past unnamed industrial towers hidden in the dirty trees, and warehouses and sheds will hide in thickets. What do they have to hide? What goes on in there? Why the covert anonymity? Why all these industrial operations that entirely lack signage of any kind? Then Wigmore will turn into Buffalo Avenue and wind past Evergreen Cemetery and neighborhoods of tiny wooden houses. Then it will arc into yet a new name, Trout River Drive, curving with the Trout River away from the St. Johns, slinking beneath the concrete bridge of Main Street crossing the Trout, and making a small but not complete circle to end by dumping itself out onto Main Street. lonely lane, one block long, bearing not one building, in the woods off of Wigmore, 13 bald tires beneath the oaks.